The Euronaval 2018 exhibition was a great success! High Eye equipped a booth at Paris Le Bourget Exhibition Center from October 23rd to 26th. 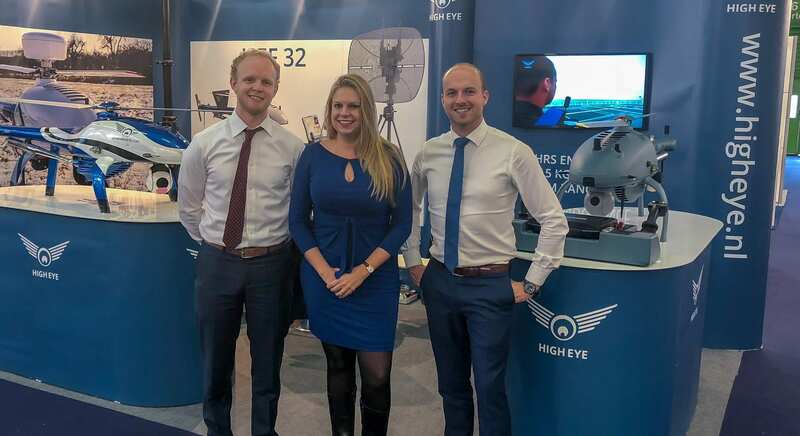 This was High Eye’s first time at Euronaval, an exhibition which focusses mainly on the maritime sector. With the future improvements on the HEF 32, such as heavy fuel options and ship-based operations, the helicopter system is gradually taking over the maritime VTOL UAV market. Euronaval has proven to be a very interesting exhibition, bringing together industry world leaders in naval technology and architecture. The combination of major shipyards, weapons integrators and cutting-edge technology providers creates unprecedented market expanding opportunities. Are you interested in meeting our team at an exhibition? High Eye will be exhibiting its UAV capabilities at AUVSI Xponential (Chicago), Sea Air Space (Maryland) and DSEI (London) in 2019. Come meet us there!